Ellen Hutson’s October Pin-Sight Challenge is all about Fall. That’s fine with me because Fall, next to Spring is one of my favorite seasons. Bright sunny days and cooler weather is my thing. I love it when I can wear sweaters to ward off the slight chill in the air, unencumbered by bulky down coats and boots. Yay! My project captures the orange and golden tones of the season along with fading greens. All the images were stamped in Versafine pigment ink in Vintage Sepia and then heat embossed using clear embossing powder. I then colored the images using Distress Inks, a paintbrush and water. The images were die cut after the images were colored and thoroughly air-dried. I die cut a center panel from cream-colored cardstock using a small rectangular stitched die and cut a slightly larger piece in a rich earthy orange-toned and an A2 sized piece in a rich brown color. All the pieces were mounted as shown and the die-cut images were arranged as shown. Everything was then mounted on an A2 top-folding vertical card base. Stamps: Essentials by Ellen: Thankful stamp set and Autumn Acorns stamp set; My Favorite Things: Linen Background stamp. Dies: Essentials by Ellen: Thankful die set and Autumn Acorns dies; Avery Elle: Wonky Stitches die set (smaller stitched rectangle). Inks: Distress Inks: Peeled Paint, Twisted Citron, Shabby Shutters, Rusty Hinge, Worn Lipstick, Wild Honey, Spiced Marmalade; Versafine ink: Vintage Sepia; Versamark ink. Cardstock: Neenah Classic Cream cardstock (center panel); Papertrey Ink cardstock: Terracotta Tile and Dark Chocolate; Neenah Solar White 110#. Other: WOW embossing powder: Copper Metallic; Pretty Pink Posh: Metallic Bronze Sequins (4mm). 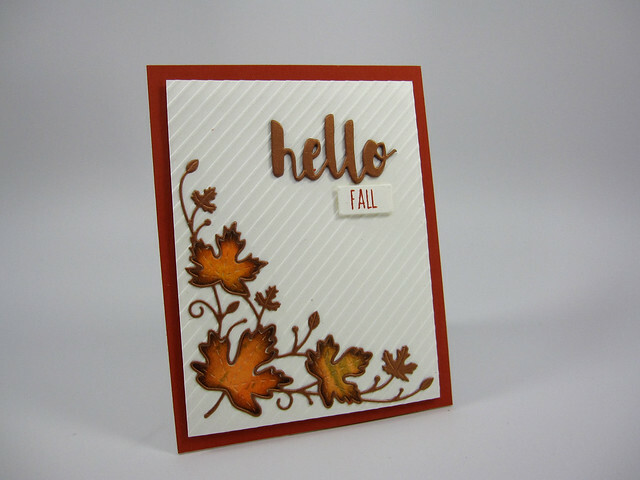 The theme for Simon Says Stamp’s Flickr Challenge #30 is “Fallin’ for Fall”. Any project that creates the feel and look of Autumn is appropriate for this challenge. My project attempts to capture the rich golden tones of Autumn with the used of metallic cardstock. I associate autumn colors with metals such as copper and bronze. I love the rich tones of these metals and how they complement the colors in the changing leaves and other foliage. I used the inlay die-cut technique for this card. I cut the Maple Leaf Corner die from copper metallic cardstock and used the outlined image in copper to frame distress water colored images. The inlaid leaves were die cut from watercolor card stock and colored using Distress Inks. I die cut the world “hello” three times, using the same copper metallic cardstock and then layered the hellos on top of each other to give dimension to the sentiment. 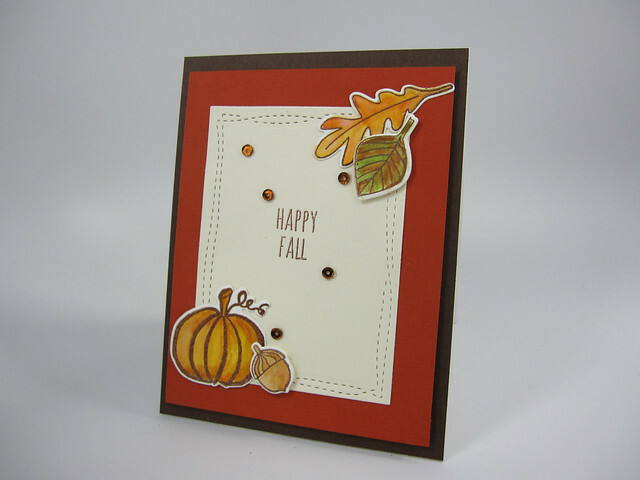 The small stamped word ‘fall’ was stamped in a deep, rich orange ink and die cut using a small rectangle die. Have a colorful and golden fall! Dies: Simon Says Stamp: Maple Leaf Corner die, Painted Hello die; My Favorite Things Die-namics: Label Tapes die. Inks: Papertrey Ink: Terracotta Tile (sentiment “FALL”); Distress Inks: Rusty Hinge, Spiced Marmalade, Dried Marigold, Twisted Citron, Shabby Shutters, Vintage Photo. Cardstock: Neenah Classic Cream; Papertrey Ink: Terracotta Tile; Stardream Metallic Cardstock: Copper; Neenah Solar White 110#; Ranger Distress watercolor Cardstock. 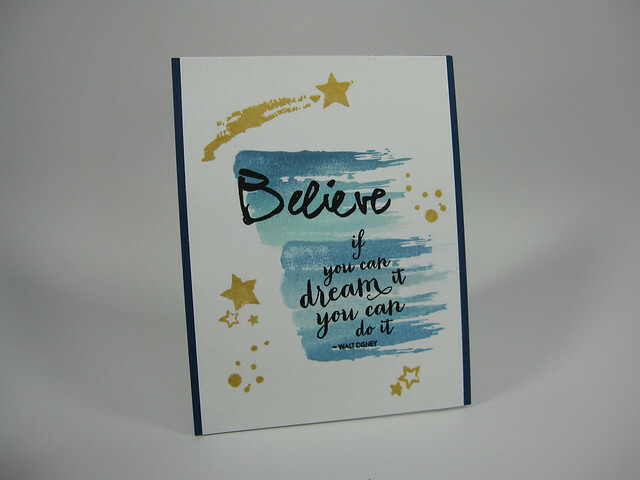 I really enjoy making and giving cards that are inspirational. This is especially true when someone I know is going through some difficult times. I want them to know that they are not alone and that I’m thinking of them. This is true for all card makers, part of the satisfaction of our hobby is making someone smile, feel comforted, or appreciated. This card is made for anyone who ever wonders if they’ll ever achieve their life’s dream. I know several people in my life who have really worked hard at finding and following their life’s purpose. So this card is for them and all those like them. Keep believing and working toward your dream because “if you can dream it, you can do it”. Part of the sentiment on this card is a quote from Walt Disney. He was a master of turning his dreams into reality. Simon Says Stamp’s Flickr Challenge #29 requires that the project you create incorporate the colors black, yellow and white. 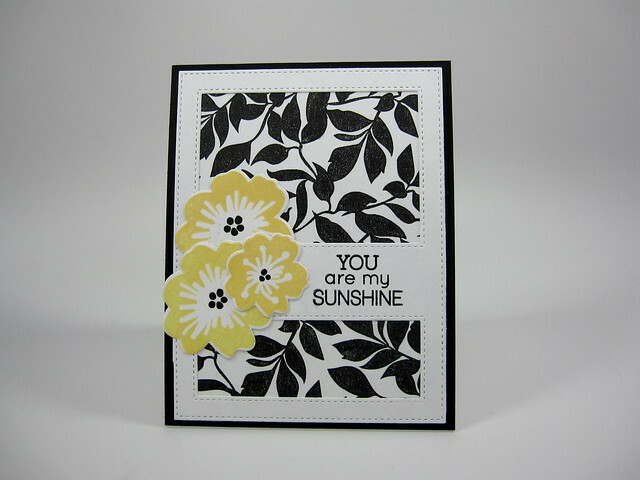 My project for this challenge is a rather bold black and white background behind a white frame with the addition of yellow flowers to soften the look of the card. I stamped SSS’s Leaves background stamp in black ink on white cardstock. I used Versafine Onyx Black ink for this because the ink leaves a really solid and detailed image. I really wanted the tangle of vines and leaves to really stand out against the white cardstock. The entire card front was mounted onto black card stock and then adhered to a top-folding, A2 portrait-oriented card base of white cardstock. There you have it, my submission for challenge #29. Hope you like it! Stamps: SSS: Leaves background stamp; SSS: Flowers on My Mind stamp set; SSS My Sunshine stamp set (sentiment). Dies: My Favorite Things, Die-namics: Stitched Cover-up Companion Vertical Die. Inks: Versafine ink: Onyx Black; WPlus9 Pure Color Inks: Hayride and Falling Star. Cardstock: Neenah Solar White 80# (card background & frame) and 110# (card base); Papertrey Ink: True Black (as mat for card front).